Earlier most of the bulbs available in the market were rated at 60 W or less. However in 2018, both Philips and Crompton Greaves have starting making 200W bulbs which are available with retailers all over India. 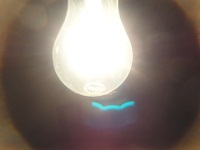 These bulbs are larger in size compared to the conventional 60 W bulbs which are more widely used.